I’ve been getting in a little morning birding this week while the weather’s been good and migration is still among us. I hit up a few of my regular spring time haunts hoping for some decent birds, and some photo opportunities. 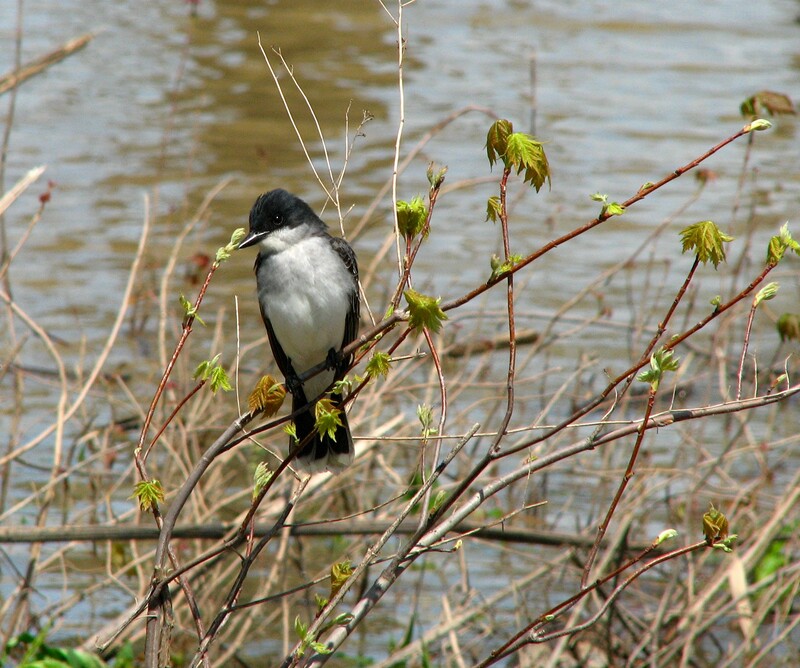 So I was off to Magrish Riverlands Preserve and Shawnee Lookout Park, both are great spots for migrant warblers. Cerulean Warbler has always been a difficult bird for me to photograph, and this individual located at Shawnee Lookout allowed me at least one decent shot, even if it’s not that great. 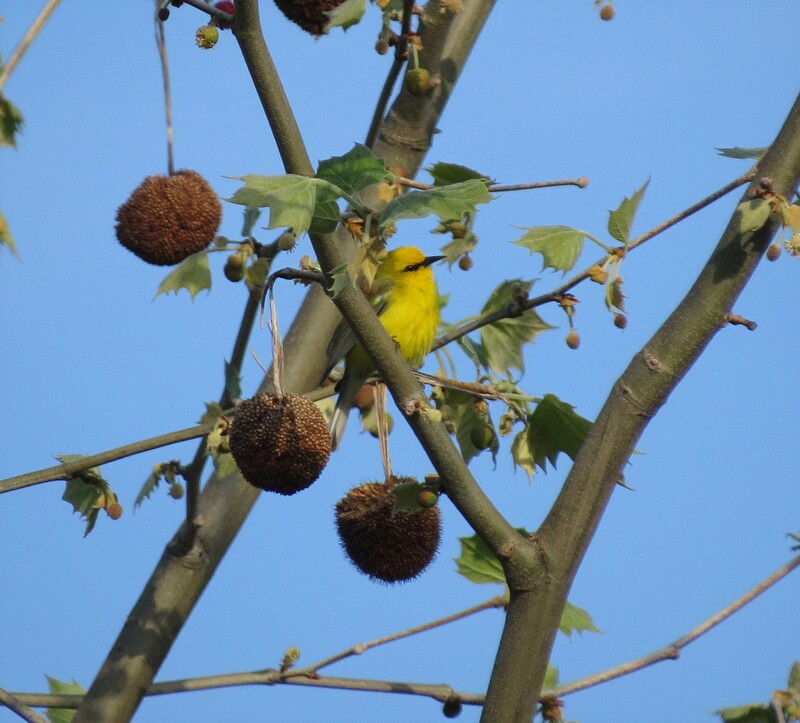 Blue-winged Warbler also at Shawnee Lookout. And how could you resist getting a shot of this Summer Tanager. 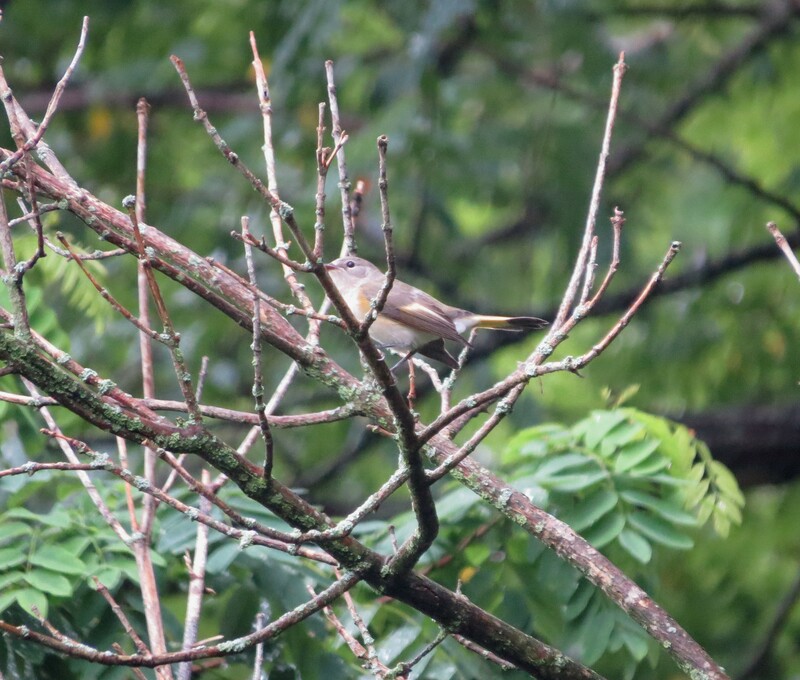 This Tennessee Warbler was found at Magrish Preserve yesterday. Also at Magrish was this male and female Red-eyed Viroes. As I watched the male was putting on courtship displays, which I’ve never seen before. There were frost warnings out for the Tri-state area as I made my way over to pick up Jon for some very early migrant birding. Both Shawnee Lookout and the Oxbow can be particularly good, so with the rising sun low on the horizon we set off in a westerly direction. Shawnee Lookout was practically empty as we set off on a couple of trails, always listening and watching. As we walked we chatted about which early migrant might make an appearance today. One at the top of the list was the Hermit Thrush. The reclusive skulker of the undergrowth is usually heard before it’s seen. So it came as no surprise that one of the birds we stumbled across, right next to the trail was a Hermit Thrush eating a worm. If you look real close you can see the worm on the ground. Yellow-rumped warblers were the dominate, and only warbler species seen at Shawnee Lookout. 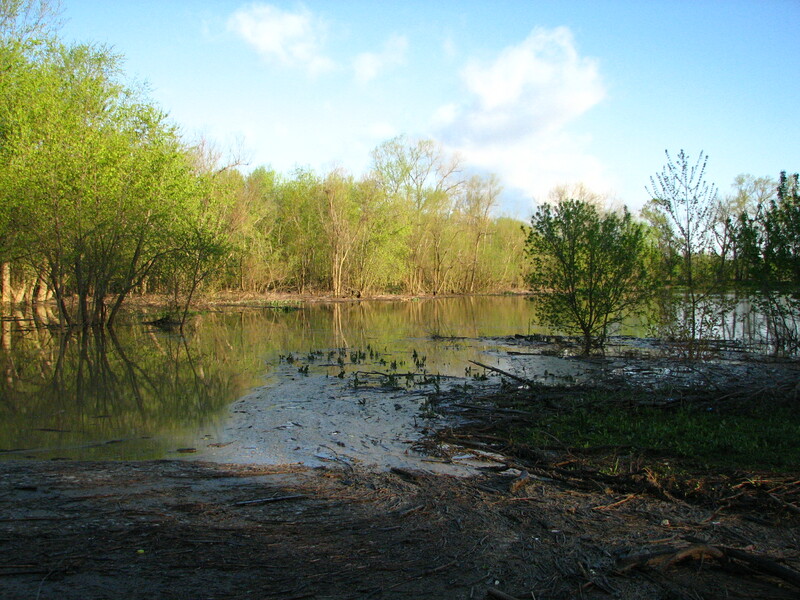 In a couple of weeks this place will be crawling with migrating warblers, but this day wasn’t meant to be. However the male Butter-butts were all dressed in their best breeding plumage, and really it’s only a matter of time before more show up. So as we were leaving Shawnee Lookout a question arises. 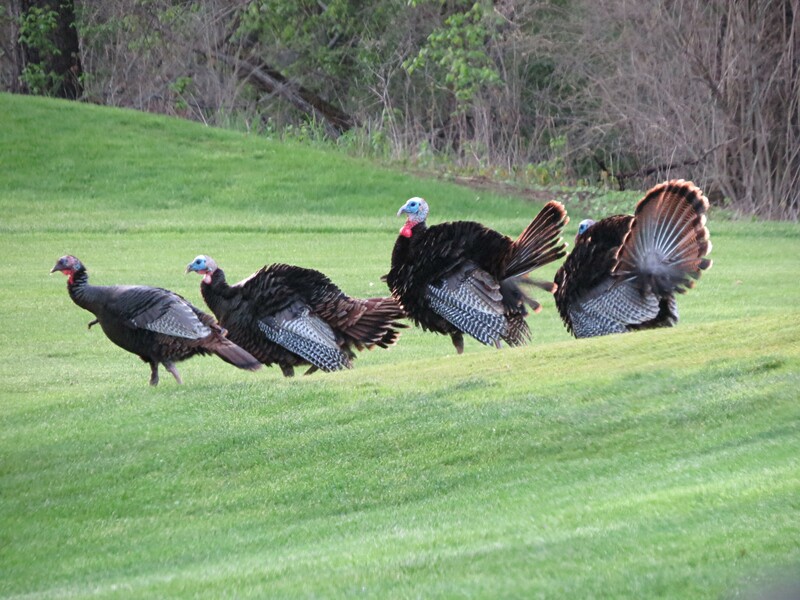 We all know what happens when the chicken crosses the road, but what about the Wild Turkey? After a short stop at Lost Bridge to count the Pectoral Sandpipers and a couple American Pipits, we arrived at the Oxbow. And quite honestly I don’t know what impressed us the most, the sheer number of Double-creasted Cormorants (we estimated about 250) or the Bald Eagles, ( which we counted 18 of them). This immature Bald Eagle landed real close to Jon and me with a fish, and proceeded to eat it. I tried to sneak up it and get a better photo, but he didn’t that too much and promptly left. Nothing quite as pretty as a Bald Eagle against a blue sky. At one time as we approached a line of trees that separates two fields we counted 12 individual Bald Eagles. It was quite a sight, but considering the distance a photo wouldn’t have done justice. However the bird of the day was yet to come. As we continued driving along the dirt road that cuts through the Oxbow we notice small brown birds foraging along the edge. And one had white edges on the tail. I quickly pull over as we get our bins on the bird. 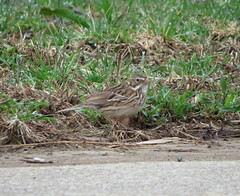 Vesper Sparrow. 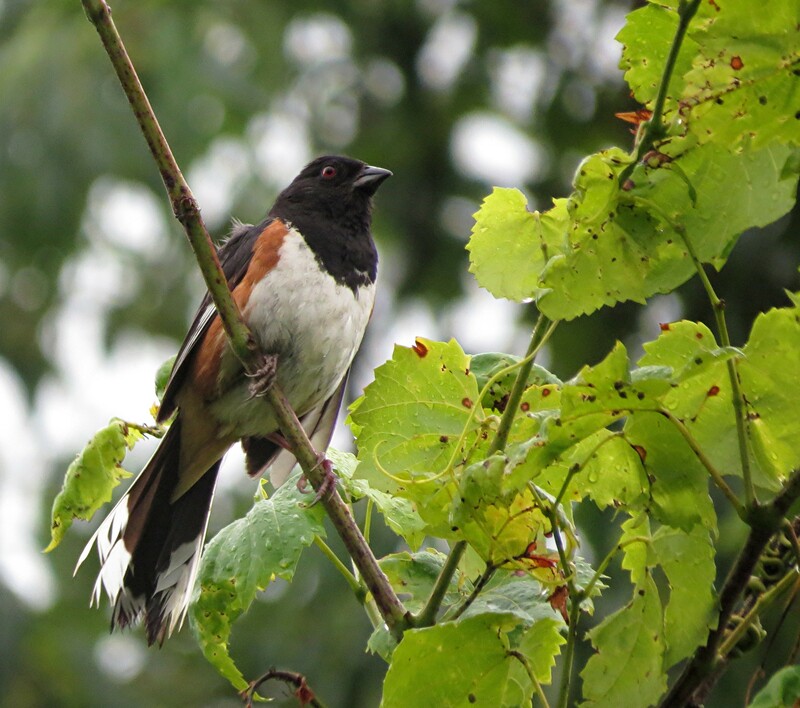 Very good bird, especially for this part of Ohio. 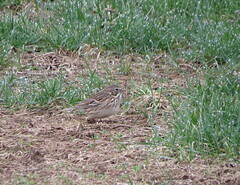 Now you might be saying to yourself that this is a pretty common bird where I live, but in southern Ohio we have maybe a 2 week window where Vesper Sparrows can be seen before they move North. And this one cooperated. That’s the thing with Jon and me, we love Sparrows, and for us this was a great bird. We made one more stop in Lawrenceburg Indiana where we walked a bike trail hoping to pick up the same birds we saw there during the Christmas Bird Count. I’ve neglected my blog lately…and I’m blaming work. Have you ever had one of those weeks where you come home after a super busy day at work and feel like just vegging out for the evening and go to bed early. That was me this week. And despite having a wonderful day birding with Jon last Saturday, I just couldn’t find the energy to sit down and write a blog post. Sorry everyone. Like I said last Saturday Jon and myself hit the woods hard looking for migrants at some of our local hot spots. Shawnee Lookout Park, Lost Bridge, The Oxbow, Smith Tract, and Armleder Park. It was a beautiful day and the birds on a whole were plentiful in some areas, however in others it wasn’t. Trying to find where the wading birds are can be a challenge, and last Saturday was no different as we tried several spots where we’ve seen them before, only to strike out every time. 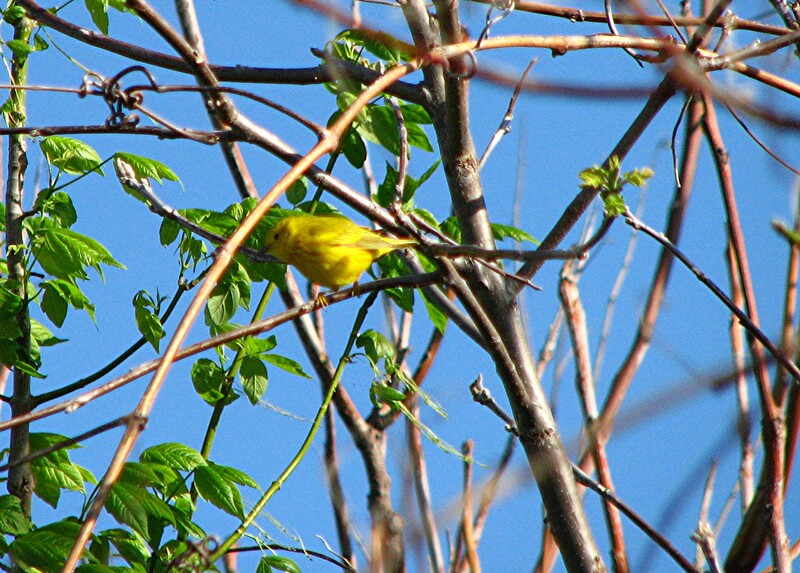 Warblers were plentiful and as always another challenge for myself trying to get any kind of serviceable photograph. Our day list was pretty good, so instead of boring you with week old birding news I’ll just skip to the list of birds intermixed with some photos. You see I need to keep this blog post short because I still have to get ready for when I go to my favorite birding hotspot tomorrow, Boone County Cliffs. Tomorrow is the 31st of July and unless there is some divine intervention, my final count will stand at 106 bird species. And what’s kind of frustrating is first my late start for this whole July challenge, and secondly is that are so many birds that I could have sighted that I didn’t. Let’s take this last Sunday. Despite the forecast of rain on and off for the whole day I still felt the need to drive to some of my favorite hot spots so I could tick off a few more birds. So it was back out onto the highway to the west side of town., particularly Lost Bridge, and Shawnee Lookout Park. Lost Bridge for early migrating shore birds and Cliff Swallows, and Shawnee Lookout for a few more warbler species that summer over in this park. 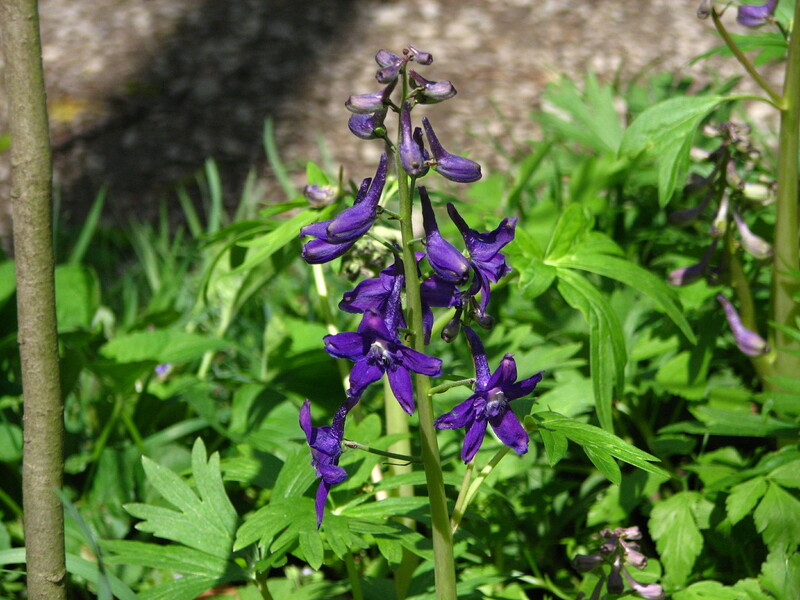 Such as Cerulean, Kentucky, Redstart, Prairie, Blue-winged, and Ovenbird. Other than picking up Cliff Swallow at Lost Bridge it was a total bust, especially with the rain picking up. You see I neglected to grab my rain jacket when I left so I really didn’t want to be soaked this early in the day with Shawnee Lookout still ahead. Shawnee wasn’t much better. There were plenty of birds, just not some of the ones I was really depending on. I was wanting to get an early start to the day when my chances were a bit better, but hitting it in the afternoon they weren’t singing as much as I would have liked. So now after completing 2 different month long challenges so far this year I have to admit that this one was the easiest. The opportunities to pick up so many more bird species may seem smaller than in the spring, however I really could have added 10 to 12 more with an earlier start in the month. January is by far the most difficult after you count up all the duck species that is found around here. After that you don’t have to many birds that you can count on being there. Plus the weather can keep the most intrepid birder at home. I’ll never forget my trip to Dayton to tick off the Glaucous Gull when the wind chill was well below zero. The wind chill in July is measured by the AC hitting you in the face when you walk into the neighborhood mini-mart for something to cold drink. Bird watching challenges like this keep the hobby fun and exciting. Instead of just going out into the field, you have to re-focus on what species you’re searching for and the habitat where you’ll find them. It sharpens your skill even if you’ve seen the bird hundreds of times before. And with January just 6 short months away it helps you prepare for the cold weather challenge. my total is 106. So remember to challenge yourself every now and then. It does make you feel better about yourself no matter what you attempt. Where has the last 4 days gone? I had nothing but the best intentions to get a blog post out to all my readers, however during migration and with other responsibilities at home I’ve been rather delinquent with some of my blog posts. So first an apology in hopes that this won’t become habit, but with migration in full bloom this promise might soon be broken as well. So bear with me during this Spring. So this posting will combine 2 field trips that Jon and myself took these past few days. Our first trip was to Armleder Park this last Thursday. Joining Jon and myself was Jason who works with Jon and is starting to accompany us every now and then. This was to be an evening trip where we just wandered around the park doing some casual birding trying our best trying to pick up any migrant. It was a beautiful evening with a stiff breeze and plenty of people in the park either watching their kids practicing lacrosse and soccer, or just walking, running, and skating around on the paved paths. The wind seemed to keep the birds a little less active and even with the diminishing light we were able to total 31 birds for the evening. I was able to add a few new ones for the year including Baltimore Oriole, Prothonotory Warbler, House Wren, and Yellow-throated Warbler. 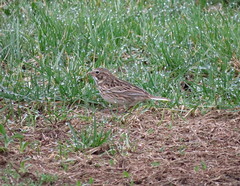 And the Vesper Sparrow eluded me again. So after a field trip I would post this trip on my blog, however Friday was kind of busy after I got home from work. Kathy and myself went out to do a little shopping and for a bite to eat. So after I got home it was getting a little too late to post anything considering I was going out the next morning with Jon to Shawnee Lookout. Saturday morning shone bright and cold as I made my way towards Shawnee Lookout. Anticipations were high, and with a early jump on the morning I was hoping for some great birding. Jon was going to join me a little later due to a previous appointment, so I arrived at Lost bridge bright and early. With some of the recent rain we’ve had the river was running high so none of the usual mud flats were visible, so my stay was short. Knowing how high the water level was it came as no surprise to see the parking lot for the boat access at Shawnee Lookout flooded. Where you see water in this picture, is usually a parking lot. 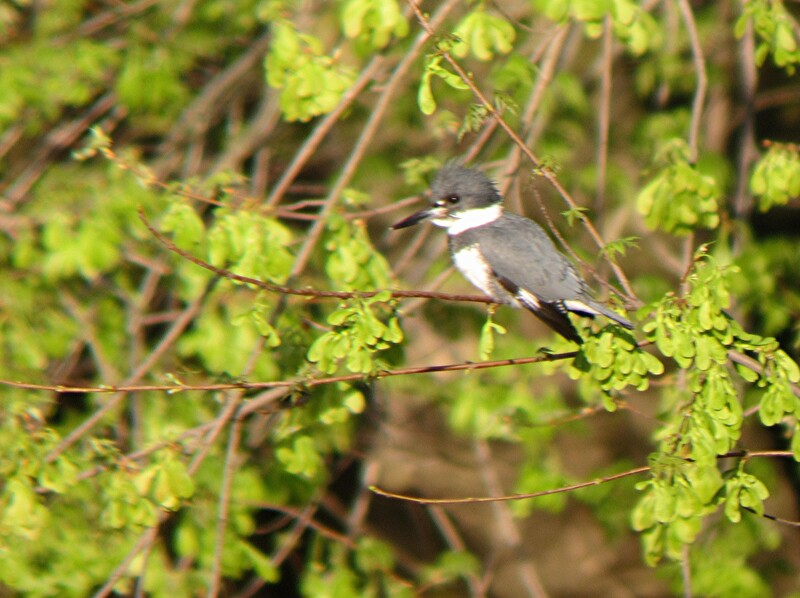 You will always find a Belted Kingfisher near the boat ramp area at Shawnee Lookout Park. The ramp down to the parking lot was abundant with birds. House Wrens once again made their voices known above all others. A lone Yellow-throated Vireo came through as I searched in vain for this small elusive bird that sang so beautifully. 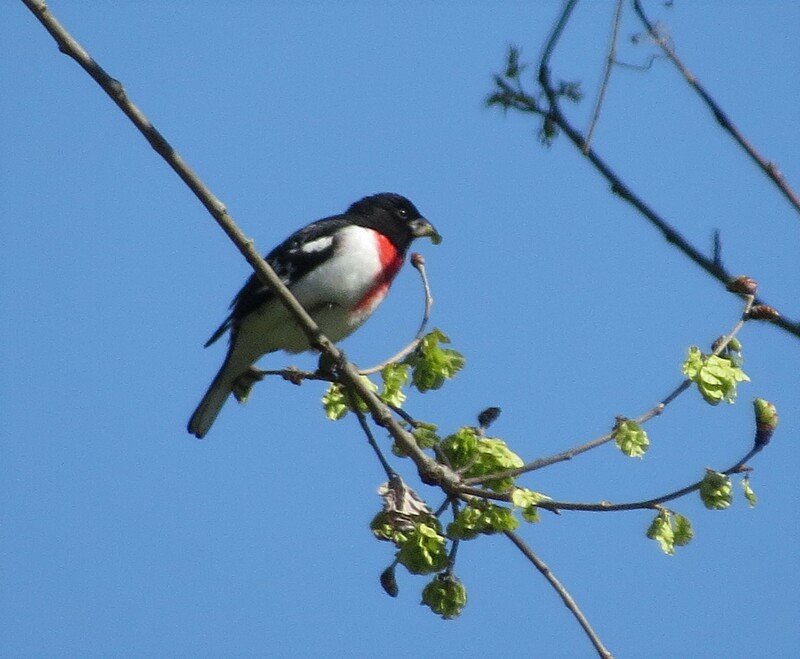 But with every Spring there is one bird I look forward to the most. Standing in the parking lot below the park headquarters a Wood Thrush started to sing. I don’t need to see a Wood Thrush to know what I’m hearing. My all time favorite bird song. I recall a time when I was camping with the Boy Scout troop I was a leader with. As usual I was up very early getting in some birding. The forest was still and quiet except for the call of the Wood Thrush. Above all else it’s voice was heard. I made my way into the park after buying my yearly pass. Up the hill through the trees to the crest of the hill and the golf course parking lot. I had to stop because a warbler was calling. 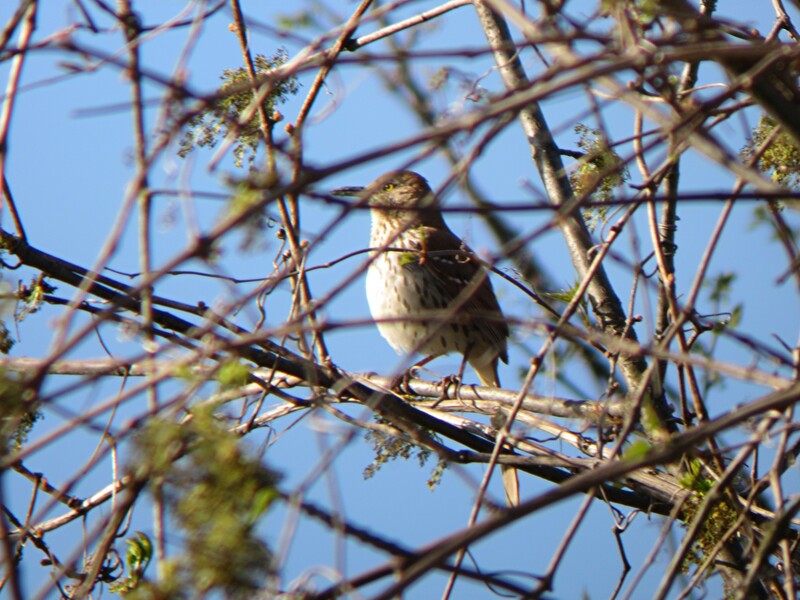 Through a tangle comes the song of the Brown Thrasher. 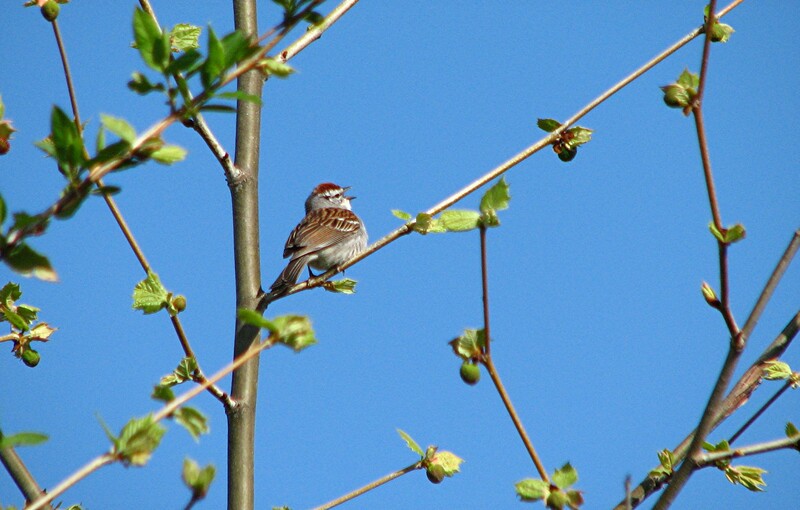 Chipping Sparrows are back in force, and Shawnee Lookout is no exception. Small in size, their voice is anything but. I was following this particular bird as it flew to the top of a branch and started to belt out it’s song. Jon finally joined me and brought along his super-cool dog Edgar. Edgar is this enormous Black Lab that has such a great disposition and was so well behaved all during the day. You barely knew he was there as we walked the fields and trails that criss-crossed Shawnee Lookout. We meet up with a good birding friend Gary Stegner who was out birding by himself, so we joined up together to what turned out to be a glorious day of birding and conversation. 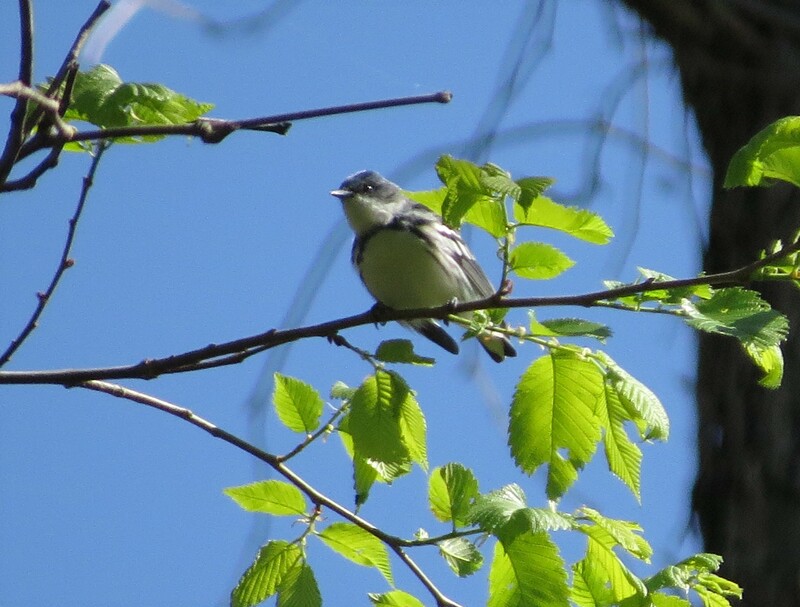 Wood Warblers and Vireos were the prime birds for the day as first-of-the-season birds include White-eyed, Yellow-throated, Warbling Viroes. Wood warblers included Prairie, Cerulean, Red Start, Yellow, and Blue-winged. 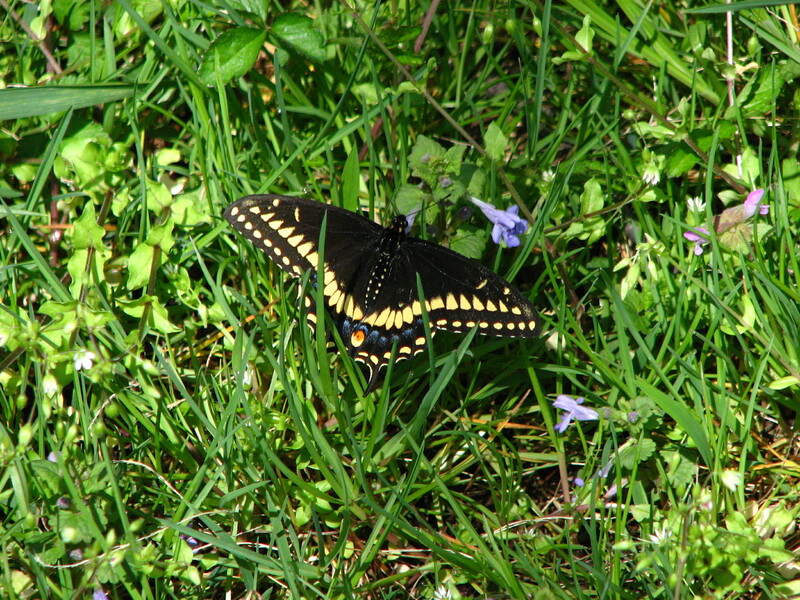 As well a butterflies being seen flying low over the ground, landing and feeding on the clover that was in bloom. As the morning wore into the afternoon Gary parted ways after almost 3 hours of birding. And for Jon and myself it was time to make our way to the Oxbow to see if it was passable for car traffic. Much to our surprise the water levels were lower than anticipated, so we made our way into the park. We watched as 2 Bald Eagles played and Blue-winged Teal feed along sky pools. A few wading birds were seen but nothing that made our hearts jump. It’s been rather a disappointing year for wading birds. 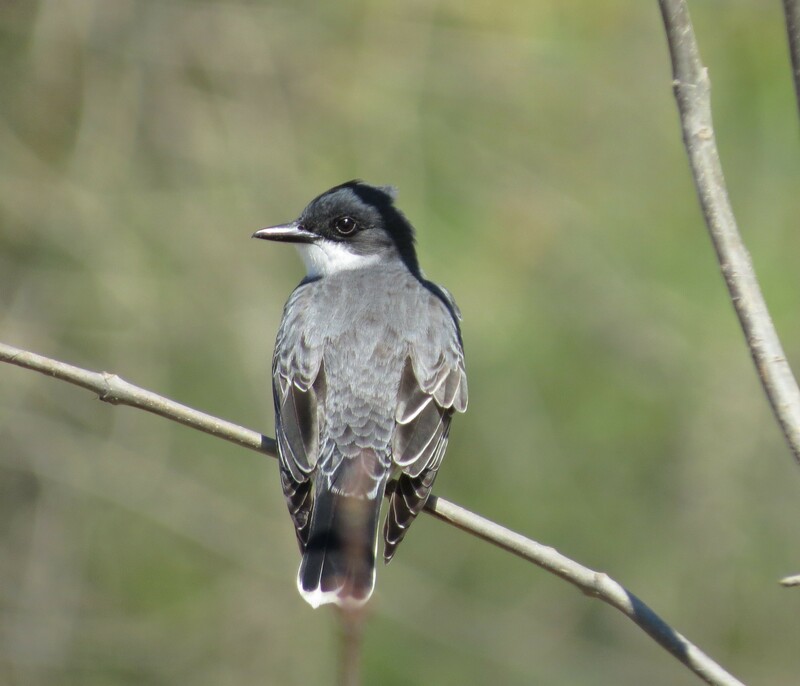 This Eastern Kingbird was so cooperative as I drove ever so close so as to get parallel to it and get it’s picture. 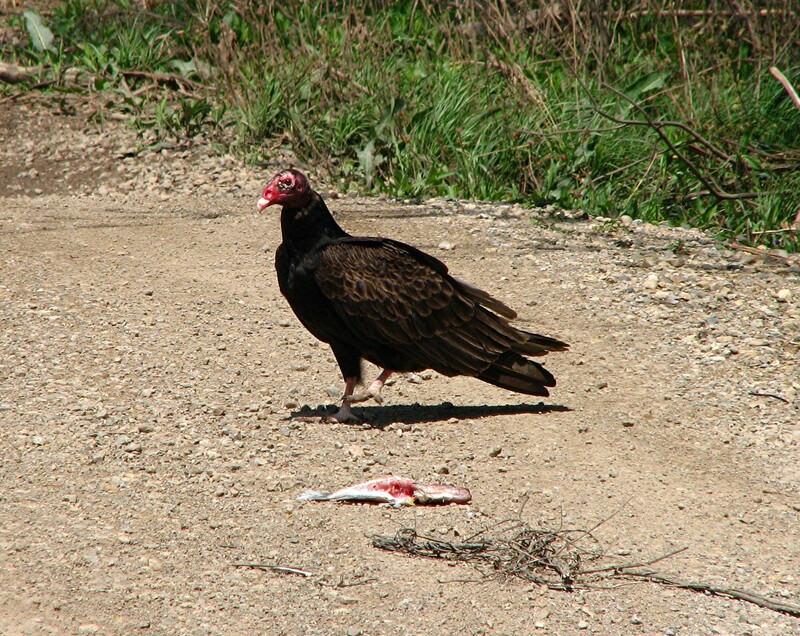 Blocking my way was this Turkey Vulture that was feasting on this dead fish in the middle of the road. As I crept closer in my car trying to get a better angle to get this picture, it dropped the fish and flew off, only to return later after it circled in the air. At the overlook for Oxbow Lake we scanned through the trees to try and locate this group of white dots on the other side of the trees in this flooded field. 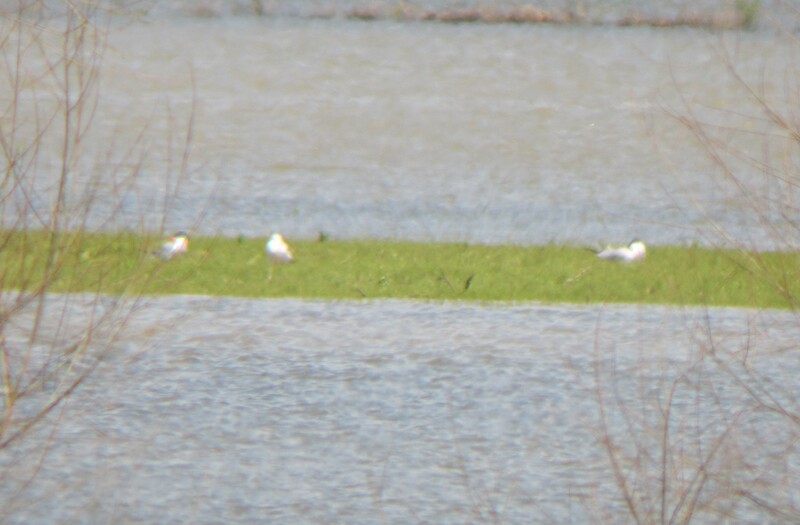 Sitting on the long stretch of grass were these 2 Caspian Terns. First of the year birds. The ones on the far left and right are the birds in question. I only wish they were a little closer, but they are Caspian Terns.